Congress has approved a final package to fund the federal government through the rest of Fiscal Year 2011, which includes $404.2 million for the Legal Services Corporation, a $15.8 million cut from FY 2010 levels. Most of the cut comes from LSC’s basic field grants—the core of LSC’s budget—which are distributed to the 136 local, independent nonprofit organizations that form the backbone of America’s civil legal aid system. The rest of LSC’s budget, including funding for technology projects at legal aid programs and loan repayment assistance for legal aid lawyers, was subject to a government-wide cut of .2 percent. See the following chart for a detailed breakdown. The House of Representatives previously passed a bill that would have cut LSC funding by $70 million. An amendment to eliminate LSC funding entirely was defeated by a bipartisan vote of 259 to 171. The bill (H.R. 1473) was signed into law by President Obama on April 15. LSC on April 5 asked the House Appropriations Subcommittee on Commerce, Justice, Science, and Related Agencies to provide $516.5 million in Fiscal Year 2012 funding, with 94 percent of the budget request going to fund 136 nonprofit legal aid programs that provide civil legal assistance to low-income Americans. Mr. Sandman and Robert J. Grey, Jr., an LSC Board member, testified before the Subcommittee. Rep. Frank Wolf (R-Va.) is the Subcommittee Chairman; Rep. Chaka Fattah (D-Pa.) is the ranking member. Continue reading LSC’s press release. Download the testimonies of LSC President James J. Sandman and Board Member Robert J. Grey Jr. Download LSC’s FY 2012 budget request. LSC’s Board of Directors is launching a Pro Bono Task Force to develop additional resources to help low-income Americans facing foreclosure, domestic violence and other serious civil legal problems. The new Task Force was announced April 5 during a House Appropriations Subcommittee hearing on LSC’s Fiscal Year 2012 budget request. The Task Force will be chaired by LSC Board members Martha Minow, dean of the Harvard Law School, and Harry J.F. Korrell III, a partner in the Seattle office of Davis Wright Tremaine LLP. Irving M. Blank, president of the Virginia State Bar, was the keynote speaker at the LSC Board of Directors’ reception in Richmond, Va., on April 14. 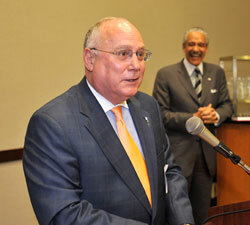 LSC Board Member Robert J. Grey Jr., a partner in the Richmond office of Hunton & Williams, is in the background. Photos by Joe Mahoney. The support of the private bar for civil legal assistance and the willingness of volunteer lawyers to take on legal aid cases cannot be overstated at a time when LSC-funded programs are stretched thin and the nation’s poverty population is growing, LSC Board Chairman John G. Levi said in his welcoming remarks at a Richmond, Va., reception on April 14. The reception in honor of the LSC Board was held in conjunction with the Board’s quarterly meeting on April 15 and 16 in Richmond. The reception honored eight law firms and the Harrisonburg-Rockingham Bar Association for their pro bono service and private attorney involvement in the six LSC programs in Virginia. The recognition of pro bono and legal aid partnerships in Virginia came a week after the Board launched a Pro Bono Task Force to develop additional resources to help low-income individuals and families facing foreclosure, domestic violence and other serious civil legal problems. The pro bono honorees at the reception were Hunton & Williams, represented by George H. Hettrick and Scottie Brown; LeClairRyan, represented by Lori D. Thompson; McGuireWoods, represented by Thomas E. Cabaniss; Sands Anderson, represented by L. Lee Byrd; Spotts Fain, represented by Brian R. Marron; ThompsonMcMullan, represented by Neil S. Talegaonkar; Troutman Sanders, represented by Neil S. Kessler, and Williams Mullen, represented by Catherine M. Marriott. Left to right: LSC Chairman John G. Levi, George H. Hettrick and Scottie Brown of Hunton & Williams, LSC President James J. Sandman and LSC Board Member Robert J. Grey Jr. The law firms have formed a consortium, Firms in Service, and meet regularly to share information about their respective pro bono and community service programs in the Richmond metropolitan area. The group has assisted legal aid programs by sponsoring fundraisers, recruiting pro bono attorneys, sponsoring clinics for low-income populations, and other collaborative efforts. The Harrisonburg-Rockingham Bar Association Pro Bono Program began in 1982 and is regarded as one of the most successful pro bono undertakings in the mid-Atlantic region. Last year, the bar closed 145 pro bono cases, and over the last 18 months, 85 percent of the bar’s firms and solo practitioners were involved in pro bono representation. 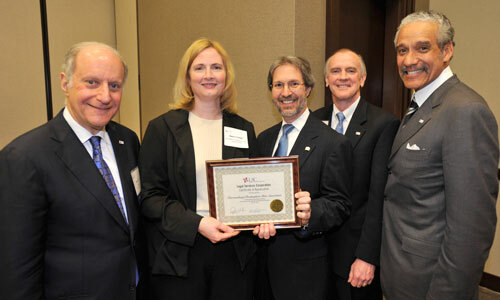 Dana J. Cornett of Harrisonburg, Va., accepted the LSC award on behalf of the bar association, where she is a pro bono team leader and a former president. Ms. Cornett also serves as president of the Board of Directors for Blue Ridge Legal Services. Left to right: LSC Board Chairman John G. Levi, Dana J. Cornett of the Harrisonburg-Rockingham Bar Association, Blue Ridge Legal Services Executive Director John E. Whitfield, LSC President James J. Sandman and LSC Board Member Robert J. Grey Jr.
LSC Board member Robert J. Grey Jr., of Richmond, introduced the pro bono honorees and introduced the keynote speaker, Irving M. Blank, president of the Virginia State Bar. The State Bar was created in 1938 by the state legislature as an administrative agency of the Supreme Court of Virginia. The LSC Board meeting in Richmond included panel discussions on domestic violence and the special projects of Virginia legal aid programs. The presentation on domestic violence was made by Maha Jweied, senior counsel, Access to Justice Initiative, Justice Department; Pamela Brown, director, Bi-National Project on Domestic Violence, Texas RioGrande Legal Aid; Larry T. Harley, executive director, Southwest Virginia Legal Aid Society; Tulin D. Acikalin, managing attorney, San Mateo County Regional Office, Bay Area Legal Aid of California, and Kendall Seal, staff attorney, domestic violence unit, Legal Services of Southern Missouri. The discussion was moderated by Cynthia Schneider, deputy director of LSC’s Office of Program Performance. According to the Justice Department, about 1.3 million women each year are victims of physical assault by a partner, and studies suggest that access to legal services can be a critical tool in helping victims escape from abusive relationships. The panel discussed the importance of securing protective orders against abusers, problems involving child custody and safe housing, and the relatively new phenomenon of cyber-stalking involving e-mail, instant messaging and electronic monitoring, such as global positioning system (GPS) devices. Domestic violence cases are on the rise at many LSC-funded programs. In 2010, these LSC cases increased by 5 percent, to 48,957, nationwide. The second panel presentation to the LSC Board focused on the delivery of civil legal assistance in Virginia. Mark D. Braley, executive director of the Legal Services Corporation of Virginia, the six LSC programs in Virginia, and a non-LSC program reported on funding for legal aid and special projects to address critical legal issues affecting low-income Virginians. The executive directors from the LSC programs were Mr. Harley of the Southwest Virginia Legal Aid Society in Marion; Raymond A. Hartz of the Legal Aid Society of Eastern Virginia in Norfolk; Stephen Dickinson of the Central Virginia Legal Aid Society in Richmond; David B. Neumeyer of the Virginia Legal Aid Society in Lynchburg; John E. Whitfield of Blue Ridge Legal Services in Harrisonburg, and James A. Ferguson of Legal Services of Northern Virginia in Falls Church. They were joined by David D. Beidler, executive director of the Legal Aid Society of the Roanoke Valley, a non-LSC program in Roanoke. Recent initiatives in Virginia include the Foreclosure Legal Assistance Project, created by Legal Services of Northern Virginia, to offer outreach and education, housing counseling, legal advice and representation to homeowners in crisis; the Serving the Homeless: Project Access, developed by the Legal Aid Society of Eastern Virginia, that ensures attorneys go where the homeless gather, including shelters, soup kitchens and parks, and the Protecting the Disabled project, sponsored by the Legal Aid Society of the Roanoke Valley, which has a long history of advocating for the rights of disabled clients. 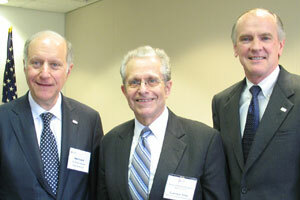 Laurence H. Tribe (center) with LSC Board Chairman John G. Levi (left) and LSC President James J. Sandman. Laurence H. Tribe, the former Senior Counselor for Access to Justice at the Department of Justice, spoke at LSC’s offices in Washington, D.C., on April 13. Tribe, a renowned constitutional scholar and longtime Harvard Law professor who once taught President Obama, spoke about the challenges and successes he experienced during his nine-month tenure in charge of the Justice Department initiative, from March to December 2010. Tribe spoke about how, with a small staff and limited funding, he sought to use his office as a bully pulpit to stimulate others and to coordinate with key entities inside and outside the government, including LSC and legal aid programs. As for successes, some had a broad impact, such as working with the American Bar Association to ensure IOLTA accounts were insured by the FDIC, while some were small but not insignificant, such as convincing a California courthouse to make its signs more understandable. Tribe’s office also helped organize a White House event on access to justice led by Vice President Biden, which included representatives from the Department of Labor, the Department of Veterans Affairs and John G. Levi of the Legal Services Corporation. Tribe also discussed strategies for increasing access to justice in an era of budget cuts, including using technology to make legal processes simpler and more accessible, tapping into the pro bono resources of large law firms and promoting the use of “unbundled” legal services. In attendance were members of LSC’s Board of Directors, Board members of Friends of LSC, staff from the Justice Department’s Access to Justice Initiative, representatives from the American Bar Association, the Center for Law and Social Policy, the National Legal Aid and Defender Association and LSC staff. Learn more about the Justice Department’s Access to Justice Initiative at www.justice.gov/atj. 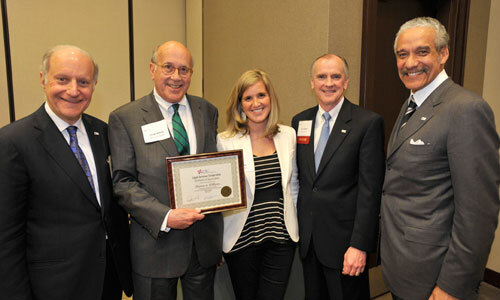 John G. Levi, a partner in the Chicago office of Sidley Austin LLP and Chairman of the LSC Board, was honored April 21 as the first recipient of the Abner and Zoe Mikva Corporate Citizenship Award at the Mikva Challenge Spring Benefit. The Mikva Challenge was founded in 1998 as a tribute to former White House counsel, federal judge and congressman Abner Mikva and his wife Zoe, a life-long advocate for educational opportunities for children of all backgrounds. Mr. Levi has taken a leadership role in many organizations that improve the lives of Chicago’s youth, including the Chicago Child Care Society, the Francis W. Parker School, the Jane Addams Juvenile Court Foundation and the High Jump Program. He has overseen Sidley’s quarter-century adoption of a Chicago public school, the Kanoon Magnet School. He is also a member of the Advisory Board of Northwestern University Law School’s Center on Wrongful Convictions. Read Sidley Austin's press release or read Mr. Levi’s remarks at the Mikva awards ceremony. I-CAN!™ E-File, a free electronic tax filing system developed by the Legal Aid Society of Orange County, processed more than $158.6 million in federal tax refunds and $50.1 million in tax credits during the 2011 tax-filing season that ended April 18. Federal tax refunds were up 26 percent from 2010 and returns from the Earned Income Tax Credit (EITC) were up 17.6 percent, the Legal Aid Society reported. The I-CAN!™ (Interactive Community Assistance Network) project began eight years ago with initial funding from LSC and has grown to include 579 partners in 49 states helping low-income workers apply for EITC. The EITC is a refundable federal income tax credit for low- to moderate-income working individuals and families approved by Congress in 1975 as a way to help offset the burden of Social Security taxes and to provide an incentive to work. When the EITC exceeds the amount of taxes owed, it results in a tax refund to those who claim and qualify for the credit. Read LSC’s March 1 press release on I-CAN!™ E-File and visit the I-CAN!™ website at www.icanefile.org. As fallout from the recession continues to decrease funding for indigent legal aid and the Texas Legislature makes tough budget choices, the Texas Supreme Court is supporting legislation to help pay for legal services for poor Texans. Hecht approached Sen. Jose Rodriguez, D-El Paso, and Rep. Will Hartnett, R-Dallas, about introducing bills to fund legal services. Senate Bill 726 and House Bill 2174 would create new court costs and document filing fees to help fund indigent civil legal aid, indigent criminal defense and the implementation of electronic filing in all state courts. Lawmakers advanced a bill to help provide free legal counsel to low-income residents in cases involving domestic violence, child abuse, and exploitation of the elderly. The Idaho House voted 38-32 [April 4] to approve the legislation. It generates money through a $10 court filing fee to help Idaho Legal Aid Services provide representation in certain cases, which can also involve veterans' issues and foreclosures. The bill narrowly survived the state House, where lawmakers set a clear precedent early in the 2011 session that tax and fee increases were unwelcome when dumping a small fee hike to help the state police academy. Republican Rep. Cliff Bayer, of Boise, says Idaho is the only state that doesn't provide financial assistance to its statewide legal aid provider. Bayer's bill now goes to the Senate. This article is available online here. For more information on the bill, click here. Emily Rena-Dozier, a Columbia Law School student, volunteers as a “LiveHelp” operator for LawHelp/NY, where she spends a few hours at a time helping users of the site navigate to the information they are looking for. She recounts her experience in an article featured in the New York State Bar’s pro bono newsletter. Excerpts are reprinted below. Click here for the full article (see page 24). This is doubly remarkable—first, because all the contact clients have with me is through an online chat program called LiveHelp on the LawHelp/NY website. They can’t see me, I can’t see them, we’re typing at each other through a little text box. Here are all the conditions that are supposed to lead to rampant online incivility, if not threats, profanity, or worse. But the clients who type out their problems to me have usually been frustrated, frequently angry, often frightened—but never uncivil. No, I’m sorry, I can’t give you any legal advice, but I can try to find you an organization that may be able to give you advice. No, I’m sorry, I can’t give you my phone number so we can talk about your problem over the phone; I’m sorry your time on the library computer is almost up but I can only talk to you online. No, I’m afraid we don’t offer help with criminal cases. No, I’m so sorry, but there are very few lawyers who will work pro bono on divorce cases unless there are special circumstances involved. The following story is reprinted from the Spring 2011 issue of Poetic Justice, the newsletter of the Legal Aid Society of Cleveland. Click here for the full issue. The residents of a federally subsidized apartment complex in downtown Cleveland presented their landlord with a list of serious issues and requested that they be addressed. The list included elevators that were out of order for lengthy periods of time, concerns regarding the security cameras and security staff, inconsistent garbage removal, bed bug and mice infestations, and dirty air filters and vents. When the tenants did not receive a response from their landlord, a group of motivated tenants, consisting entirely of seniors and individuals with disabilities, decided to take action. The tenants began to deposit their rent with the Cleveland Municipal Housing Court; they also brought their case to Legal Aid. Abigail Staudt and Jane Messmer, attorneys in Legal Aid’s Housing Practice Group, represented the tenants throughout the Housing Court’s mediation process with the building’s management company. The resulting agreement dramatically improved conditions at the building. The landlord also implemented a more effective system for resolving infestation issues and for responding to the maintenance of the ventilation systems, installed more security cameras, and put a visitor policy into effect.